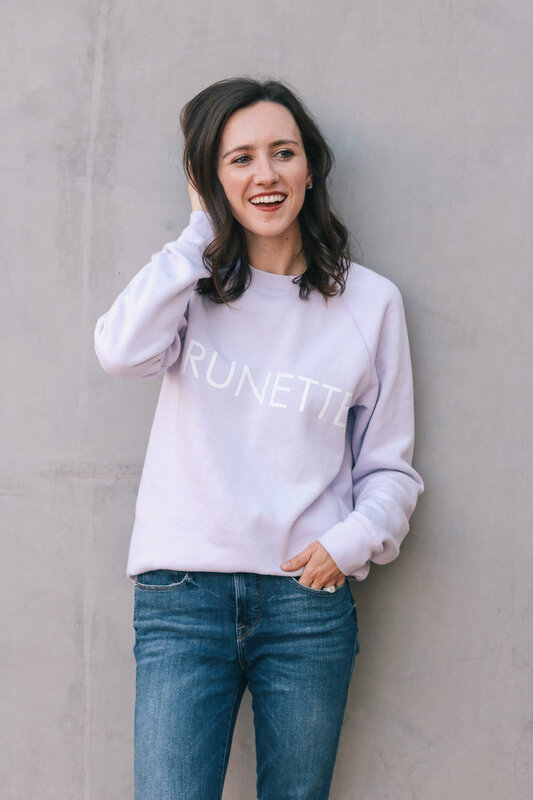 One of my favorite colors that I’ve been seeing more and more of this season is lavender! It’s such an unexpected hue for fall, and a breath of fresh air from the usual dark tones of green, burgundy and taupe. I’ve seen this color paired back to grey, green, navy and even rust! The first lavender piece I picked up this month was this subtle, striped scarf that I’m so excited to layer with and experiment with. The next was this fun, cozy sweatshirt, which was actually a gift from my brother-in-law! I wore this sweatshirt on the day of Freddy’s half-marathon in Long Beach and it was so perfect for a chilly morning by the ocean. It’s still just a little too warm in Arizona to wear it for more than 30 minutes (about how long it took us to shoot these photos!) but you can bet I’ll be wearing it non-stop when it gets colder! I can totally see myself wearing it with leggings and my adidas sneakers for a day of running errands. For this particular look I paired it with my comfy Good American jeans and these Target sandals in navy. 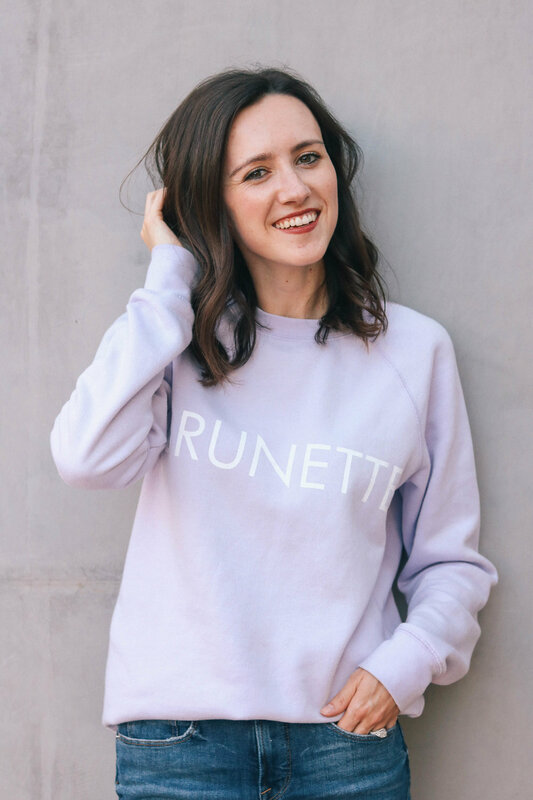 One of the reasons I love this sweatshirt is that it gives us brunettes a reason to brag a little ;) Some say blondes have more fun…but brunettes do it better! 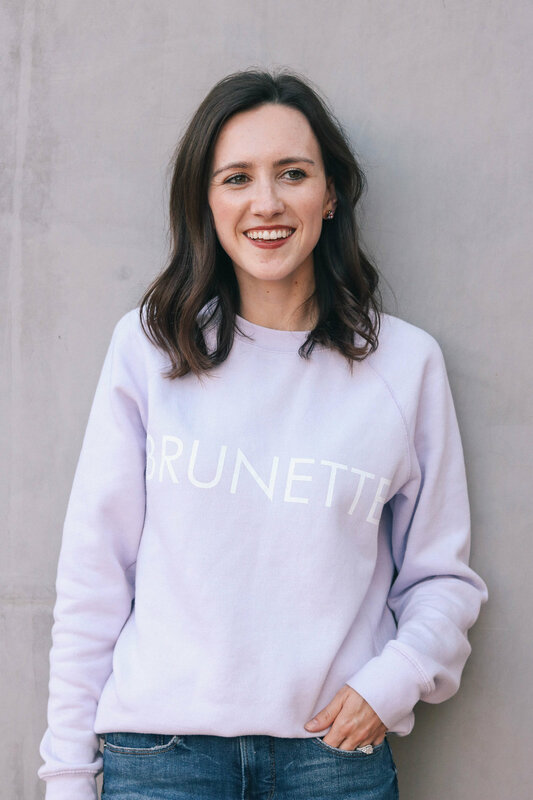 #duh #proudbrunette And I’m feeling even more proud after taking several inches off my hair a couple weeks ago! I always go back and forth when it’s time to get a haircut—do I just get a trim and keep it long or bite the bullet and get it super healthy by cutting off more length? I was feeling a bit adventurous that day and decided what the heck, let’s just cut it off! After all, hair always grows back. I hadn’t told Freddy what I would be doing to my hair, so he was completely surprised when he came home from work! It feels so much healthier and bouncier now, and ready to bring on the holiday season! If you live in Scottsdale area and are looking for a new hairstylist, check out my friend Sarah, she’s amazing!